Susan Rebecca White’s A Place at the Table introduces the reader to three troubled characters, each with a heartrending story. Their lives intertwine like a macramé wall decoration; the events that draw them all together define chaos theory: a bird poops in South America and a tree grows in Brooklyn! Ms. White folds the characters into a relationship like folding ingredients into a recipe. The three characters are: Alice, an elderly black woman; Bobby, a young homosexual; and Amelia, a middle aged housewife. Each character experiences a level of grief in his or her life. Ms. White’s point of view choices are interesting. She opens the book in the third person as she tells Alice’s story as a child in Jim Crow Georgia. Alice’s story covers two events in 1929, the lynching of a black man, and the loss of her beloved brother, James. When Alice and her brother experience the horror of finding a young black man who has been lynched this event provides the turning point in the lives of both of these young people who love each other desperately, and yet each must go their own way, never to meet again. The reader would be prudent to pay close attention to the foreshadowing that is set up in part 1. It is in part 2 that Ms. White begins to weave two lives together in spite of these characters not knowing one another. Bobby’s story covers 1970–1989 and appears to be the central story of the book. A young man who discovers early that he is sexually drawn to men, he suffers at the hands of a bullying brother, and religious parents whose discovery of his homosexuality drives him to extraordinary action. In part 2, Ms. White switches to first person to tell Bobby’s story. A wise choice, as she uses this point of view to engage the reader to become Bobby and experience the crushing events of his life and understand this reasons for the life-changing decisions he makes. We walk through his life from childhood to adulthood as he recognizes his different approach to life. We follow him to his exit from Georgia to his new life in New York City, through the AIDS epidemic and its effect on him, and his growing career as a chef. In the middle of Bobby’s story, Café Andres begins to rise as another character in the story. 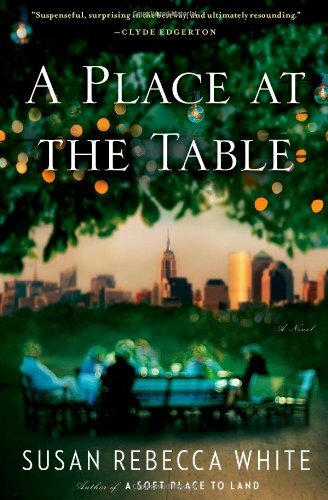 Ms. White cleverly links Alice (part 1) to Bobby (part 2) to Amelia (part 3) through the restaurant Café Andres, an intimate café in the heart of New York—the metaphorical table. Ms. White uses an interview with Gus Andres, owner of Café Andres and a secondary character, as an interesting means to introduce the backgrounds of Alice and Bobby. She uses this technique to provide answers to questions the reader has not yet asked, but nonetheless hang out there in anticipation. In part 3, Ms. White continues with the first person narrative in the role of Amelia. Amelia’s story picks up in 1989 and moves through 1991. A middle-aged woman whose life crumbles as her marriage dissolves around her, Amelia is forced to reexamine her life. She seeks the comfort of a favored aunt, whose advice may not be what Amelia wants to hear, but is nonetheless good; recommendations that, once taken, cannot be reversed and through her journey of reevaluation, she discovers a startling truth about her family. Transitions from parts 1 to 2 to 3 are very smooth: Bobby coming to the café and developing his reputation; Alice introduced as previous owner of the café; Amelia, a patron whose life is changed through her connection with Bobby and Alice. Throughout the book, Ms. White foreshadows what is to come, and as the reader moves through each character’s story, that foreshadowing hovers in the background. We know it’s there; we know we are being told about something more to come, and yet not until events occur do we become aware of how skillfully Ms. White planted her clues—right there, out in the open! A Place at the Table is a great read; it’s a page-turner. Ms. White makes excellent use of the five senses to draw the imagination into each scene—and the reader learns some great cooking tips!